Everything—no matter how innocuous or dated—had its use. It was a mantra he lived by. Born in 1946 to an Irish immigrant father and an American mother of French-Canadian descent, his parents’ coming of age was marked by the Great Depression plus decades of war. Unsurprisingly, this meant that his parents, Pat and Stella, were more than practical when it came to purchases and investments. They were intentional. They were frugal. It was “waste not, want not.” And they never threw anything away—a way of life that he held on to long into adulthood. But one day, Pat and Stella’s hoarding and his resulting belief that everything was useful, changed my life. After one of his routine check-ins with Pat and Stella, Dad arrived home with what looked like a small, hardcover suitcase. It was a shiny steel blue. He swung the case onto the kitchen table and called me over. He unlatched the cover and pushed it back to reveal the contents. This is a piece of my story. And everyone has a story to tell; a glimpse to provide—including your B2B brand. Storytelling is civilization’s oldest form of communication, helping us teach, entertain, preserve our histories and cultures, and instill our values. We’re programmed for stories. Our brains light up when we hear and see stories unfolding. But the challenge for many B2B marketers is to weave a story web that is everything to their customers and prospects. It needs to provide that meaningful glimpse. It needs to be familiar. It needs to be authentic. And it needs to resonate. The bottom line? It’s no longer enough to inform buyers. Instead, you must provide story-driven content that connects on both intellectual and emotional levels. 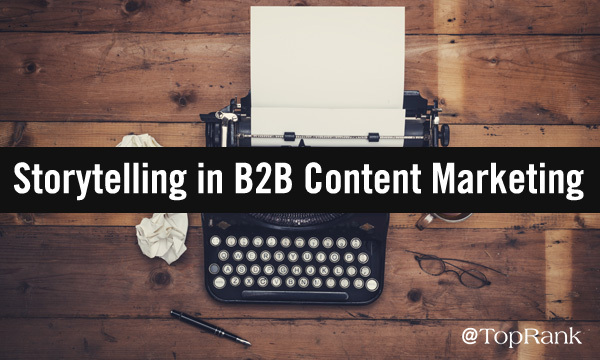 Whether you’re building a large-scale brand narrative or pulling at story threads, here are a few things to keep in mind as you commit to storytelling in your B2B content marketing initiatives. #1 – Commit to storytelling by doubling-down on what’s already familiar. Contently co-founder and recognized journalist Shane Snow is widely known in marketing circles for his knack for storytelling and his dedication to helping other marketers harness their storytelling skillset. A couple of years ago, I had the privilege of seeing Shane speak on this very topic at MarketingProfs B2B Forum. At that time, he laid out a three-step framework for telling better stories and it resonated with me. Create timely, seasonal, and evergreen content that tells a story at every stage of the funnel. Connect your audience with your stories by determining the right distribution channels and content types—based on your audience’s preferences and your objectives. Optimize and refine your stories to ensure your creating content that undoubtedly connects. The concepts outlined in his framework should feel really familiar—they’re meant to, from my perspective. (Familiarity is a hallmark of good storytelling.) The switch is defining how you show and tell stories your buyers will care about, rather than simply creating more content. For a more in-depth look, check out Shane’s storytelling course that outlines the science of great stories, the elements of effective storytelling, and much more. #2 – Introduce your audience to new characters. Content is absolutely everywhere. And trust in marketing—among consumers and your C-suite—is low. As a result, buyers are looking to those they know or those they think they know for insights, answers, and recommendations. And this means there’s never been a bigger opportunity to partner with other “storytellers” to add new dynamics to your content. “In order to tell a compelling story, you have to be immersed,” Ursula Ringham states. “Bring empathy and understanding, bring purpose, and bring insight—the latter of which influencers can certainly help with. When you co-create content with influencers, you not only provide influential experts with a medium to share valuable insights, but you can also provide your audience with a mix of perspectives—significantly upping your storytelling capabilities and credibility. “Partnering with an influencer allows you to highlight your brand’s own existing narrative in a new way, so that you can reinforce the proof points you really want your customers to know,” Whitney Magnuson, Global Head of Social Media and Influencer Programs for IBM, told us not long ago. #3 – Steer clear of fantasy or fiction. The nostalgic tale I opened with is more than a fond memory. It’s a glimpse into who I am, where I came from, and how I got here. It’s my truth. It’s my context. It’s a piece of my story. Every brand has the opportunity to find, show, and tell their own stories. Stories about who they are, what they stand for, and how they solve problems. Stories that bring truth and add context. Stories that resonate and inspire. So, dust off your brand’s old hand-me-down typewriter and get to work. It’s storytime. Senior Director of Digital Strategy Ashley Zeckman and Content Strategist Annie Leuman are on the ground at Social Media Marketing World in San Diego from March 20-22, 2019. And as always, you can count on us to deliver you first-hand learnings and stories from the conference floor. Follow @azeckman, @annieleuman, and @toprank on Twitter to get live updates.